Grambling State University is proud to celebrate the contributions of Dr. Larry J. Pannell, Director of Bands and Head of the University’s Music Department. 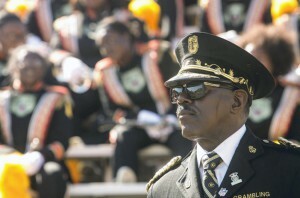 For 26 years Dr. Pannell, most known for his leadership of the Grambling State University Tiger Marching Band, has contributed to a long list of accomplishments in Louisiana and across the nation. Thank you, Dr. Larry J. Pannell, for your many contributions and years of hard work. This entry was posted in awards, gramstory, staff, video on May 10, 2018 by Jovan Hackley.